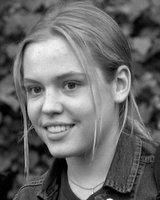 Ever since I first saw Agnes Bruckner in the movie Murder by Numbers a couple of years ago I kept thinking about her from time to time, and I would occasionally look for her pictures on the Internet wondering whether it makes sense to act like that. Finally, I decided to take seriously my interest in her and have a go at discovering what kind of person she really is. So I started looking for ideas of reaching her. It occurred to me that out of pure curiosity she might be visiting sites about her. And so one day she could discover my site, if I had one. If she liked my site she could even want to say hello to me and then we would see if we can develop any kind of relationship. 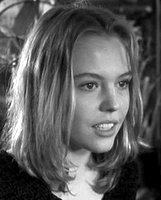 The movie The Glass House focuses on another young and attractive actress, and Agnes Bruckner appears only sporadically. However, seeing her walking, talking and smiling in these few scenes can bring delight to anyone who likes Agnes and takes an interest in what she is doing. 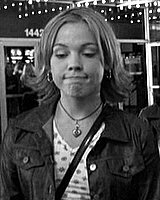 I first saw Agnes Bruckner in the movie Murder By Numbers a couple of years ago and ever since that — you know — I will never forget her... In this movie Agnes plays a beautiful high-school girl and this makes me wonder what Agnes is like in her private life, among her own classmates. In the movie Blue Car Agnes Bruckner appears without make-up. And this is a nice opportunity to take a good look at her beauty. Seeing the natural irregularities on her skin makes it easier to wonder what kind of person she really is. In the following mp3 file you can hear the name of Agnes Bruckner pronounced by the director of the movie Blue Car: Agnes-Bruckner.mp3. It should be AG-ness BRUCK-ner where capital letters indicate the stressed syllable. The first syllable of Agnes has the same sound as bag. And notice that the u in Bruckner is pronounced like the u in buck.